In fact, there are a lot of popular alternatives to breakfast that can help you get your day going. I've talked about overnight oats in another post, and protein smoothies are also another example of a quick and easy breakfast. This time, I want to talk about smoothie bowls. They sound odd, I know. For the most part, they are exactly what they sound like – a smoothie in a bowl. But, the texture is a bit different, so it feels more like you are eating ice cream. You also have your choice of toppings and some people really go all out in that area. 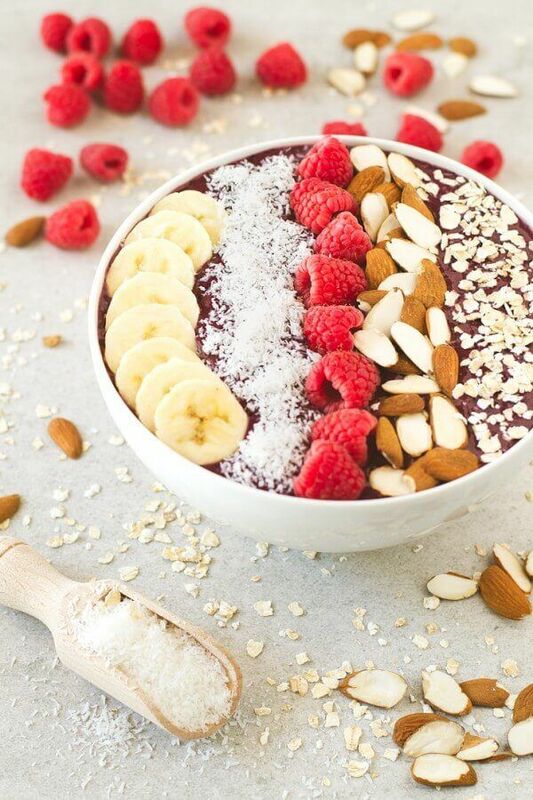 The texture and toppings alone make smoothie bowls quite appealing. But, there's also one more reason. Typically, you will feel fuller after eating something than drinking something, even if the two things were basically the same. 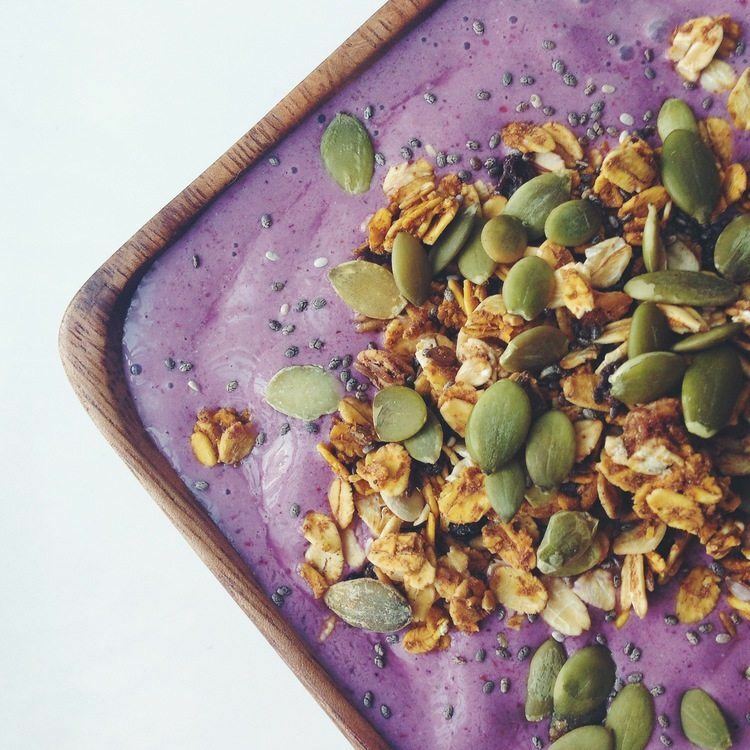 So, a smoothie bowl will tend to make you feel more satisfied than a normal smoothie. Besides, with all of these options, why not give smoothie bowls a try. 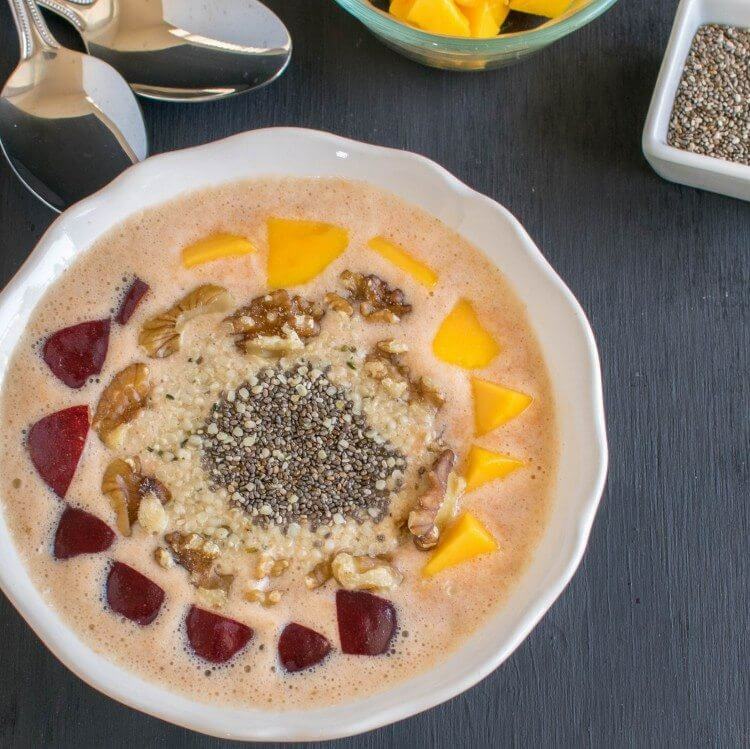 To kick off this list here's a smoothie bowl with an unexpected flavor. Carrot cake isn't a particularly common smoothie flavor in general, but it seems to go quite well in this smoothie bowl. The use of carrots also means that this recipe is particularly healthy – and it even contains some hidden greens. You can check out the full recipe at punchofyum.com and it really is worth giving this one a try. This smoothie bowl does seem a little over-the-top when it comes to toppings, but you don't actually have to put all of them on there. Instead, you could just pick the toppings that you find the most appealing. 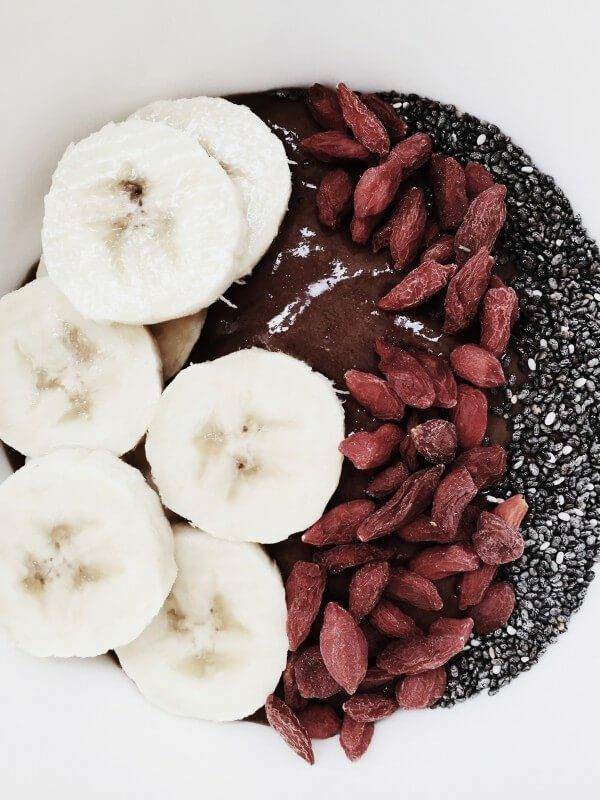 The smoothie bowl itself is chocolate flavored, so you might choose to pick toppings that complement that flavor the best (like the coconut and cacao nibs). As usual, you can find the full recipe at the site it comes from, which is fragrantvanilla.com in this case. This smoothie bowl does still have a number of different toppings, but the toppings do seem a bit less overwhelming. Surprisingly, this recipe is actually a very simple one, relying mostly on strawberries and bananas. It does look sound like a particularly yummy start to the morning though. You can find the full recipe across at foodfaithfitness.com and yes, it really does just have five ingredients. The dark red color of the smoothie itself is really cool and it's a good recipe if you are wanting something that is just a little bit different. This particular smoothie bowl recipe is also interesting because it is exceptionally simple. In fact, the main smoothie contains only three ingredients. You can check it out at downshiftology.com. Here's another smoothie example with really cool coloring. This time, the smoothie is blueberry and cacao, so it isn't hard to see where the colors come from. 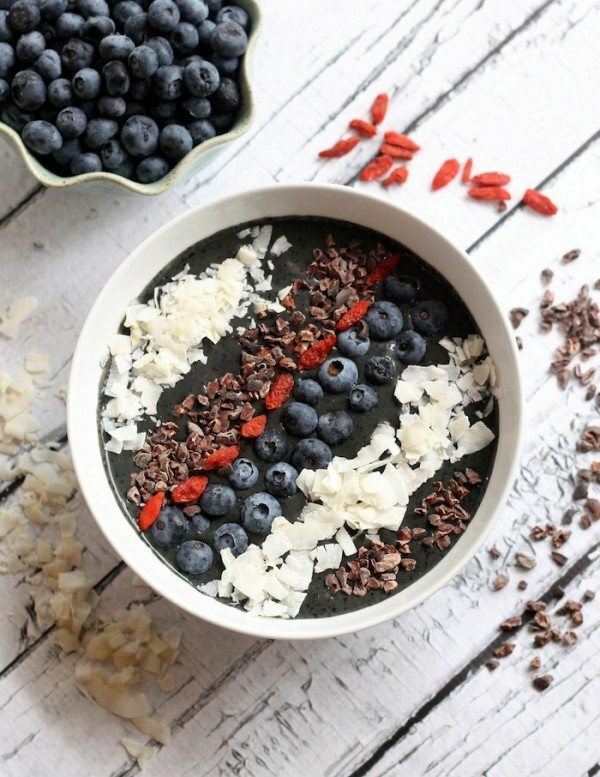 Personally, I love the choice of toppings with this smoothie bowl, especially the coconut and the goji berries because they just stand out so much. You can check it out at hummussapien.com and, of course, you can use your own toppings if the ones in the image don't appeal to you. 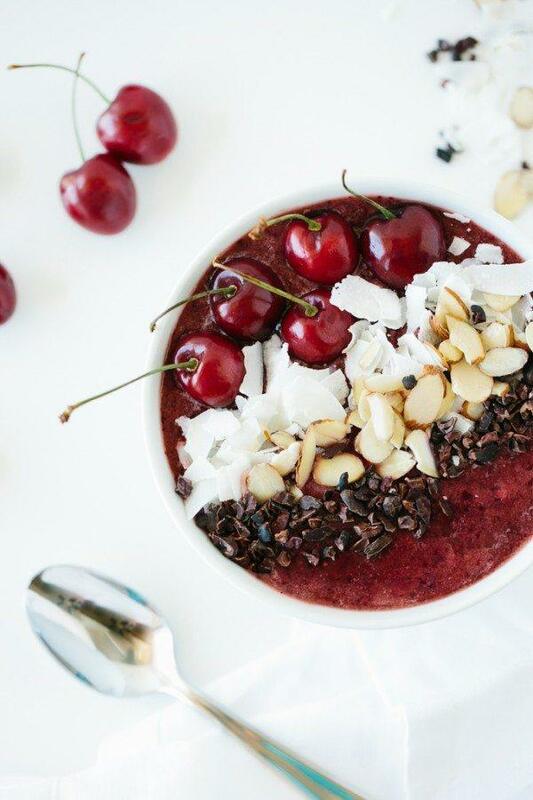 This smoothie bowl ticks all the boxes in terms of special diets, managing to be vegan, raw, paleo, gluten-free and dairy-free, all at the same time. That makes the smoothie a great option for pretty much anything. It also has some kale in there, so you're even getting your vegetables from the breakfast. 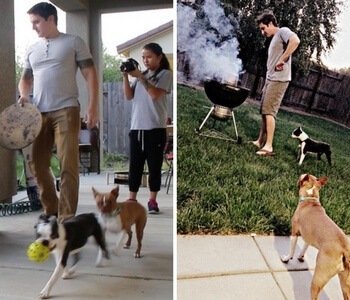 You can check out the full thing at thehealthyfamilyandhome.com if you're interested in having a go at it yourself. 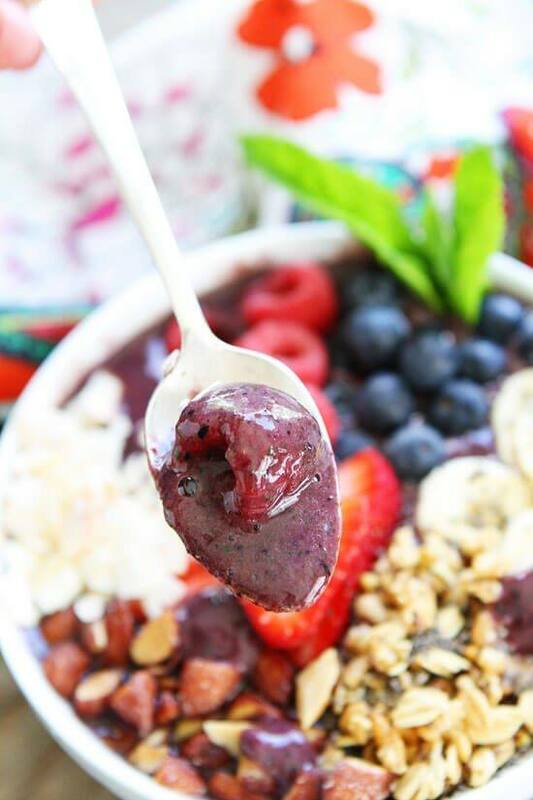 This berry smoothie bowl comes from twopeasandtheirpod.com and it's another one that is absolutely loaded with toppings. In this case, I think the authors just put the toppings on there to show what you can do – rather than suggesting that you should load your bowl up with this many toppings. 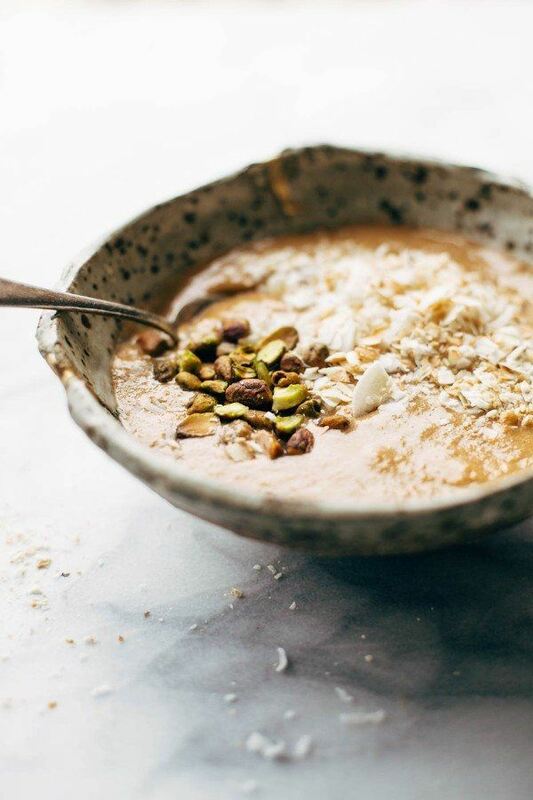 I do like the choice of ingredients in this smoothie bowl, and I think you'd end up with something that tastes great and is also healthy (which is always a great combination). 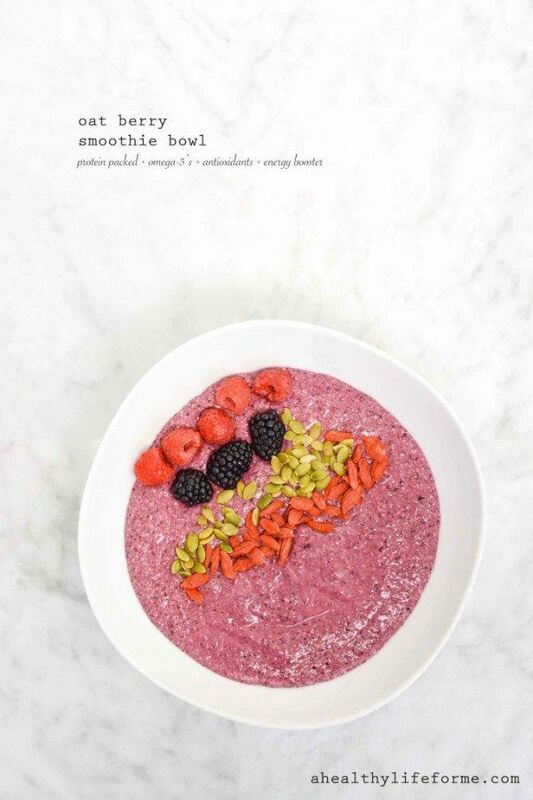 This smoothie bowl recipe comes from omtati.com and I'm completely in love with the photography. The actual smoothie recipe itself is fairly simple, and it seems like a great way to get a chocolate flavor first thing in the morning. 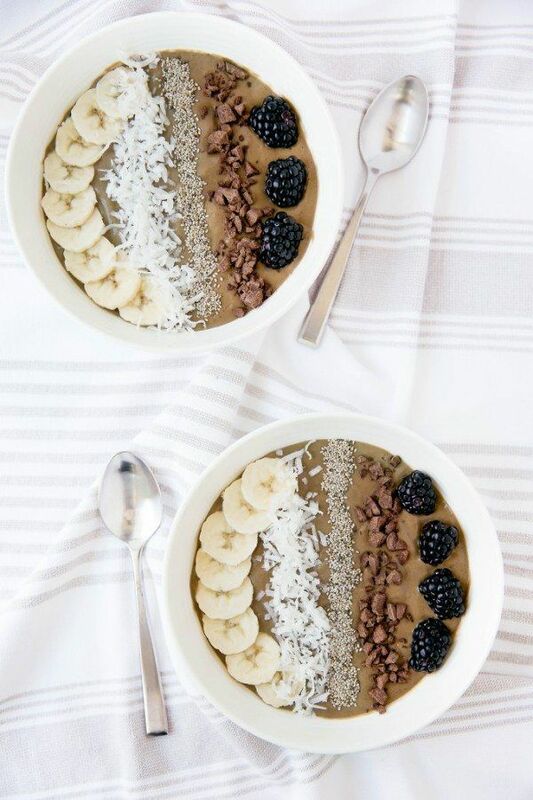 In general, chocolate smoothie bowls are fantastic, because it really does seem like you are having dessert rather than a healthy breakfast. 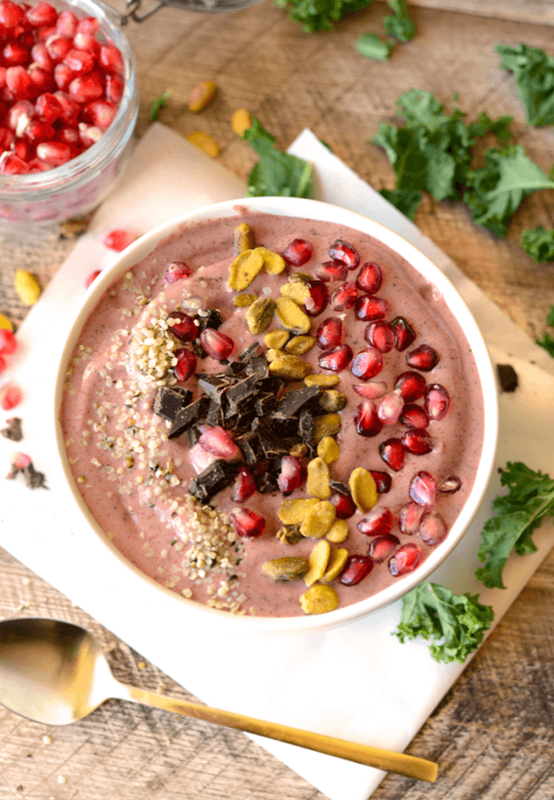 This smoothie bowl uses one of my favorite fruits, pomegranate. Pomegranate is very healthy and popular, but you don't see it in smoothies all too often. With this recipe, pomegranate is a key ingredient in the smoothie, and is also used as a topping, which would work great. The recipe itself comes from fitfoodiefinds.com and it offers a good flavor that goes beyond just pomegranate. Including coffee in a breakfast dish is one of the best ideas ever. Many of us already rely on coffee to give us a kick start first thing in the morning, so why shouldn't we get that jolt as part of our breakfast? 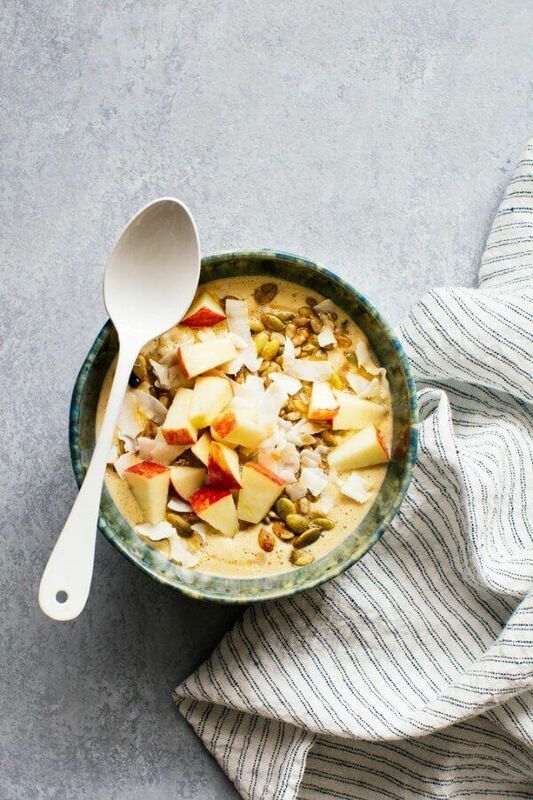 Besides, in the warmer weather, a cup of coffee isn't the most appealing thing at the start of the morning – while a smoothie bowl works well on warm days. You can find this recipe over at ambitiouskitchen.com if you're interested. You can also leave the coffee out of the recipe if you aren't a bit fan – or if you prefer your coffee in a cup. This smoothie bowl is from kaleandchocolate.com and the color alone should show you that the smoothie bowl contains greens. The recipe is interesting because it is flexible enough to let you switch out the greens you use based on which you prefer and what is available. With all of the greens included, this recipe is going to taste less like dessert than many other recipes on this list. That isn't really a bad thing though. If you're focusing on health and nutrition the taste of a green smoothie or a green smoothie bowl may well be appealing. The flavor choice for this smoothie is a bit unusual, bit it does seem to bring the whole recipe together nicely. I do actually like the color too because it is a little bit different than most other smoothie bowls. The recipe itself comes from thelemonbowl.com and it is an easy one to make. It's also worth noting that there is only one ingredient in this recipe that specifically creates the chai flavor. The creator does offer an alternative to this ingredient too, so you could create a variation on this recipe if you weren't particularly fond of chai. Visually, this recipe is absolutely stunning in the bowl. The bright green color does make the smoothie look very healthy, and the ingredients used mean that this is actually a healthy smoothie. The recipe is actually for both the smoothie itself and for the buckwheat crispies that are used as a topping. Now, you could just make the smoothie bowl if you preferred, but I think the crispies sound pretty good too. Either way, you can find the recipe at thegreenlife.ca. 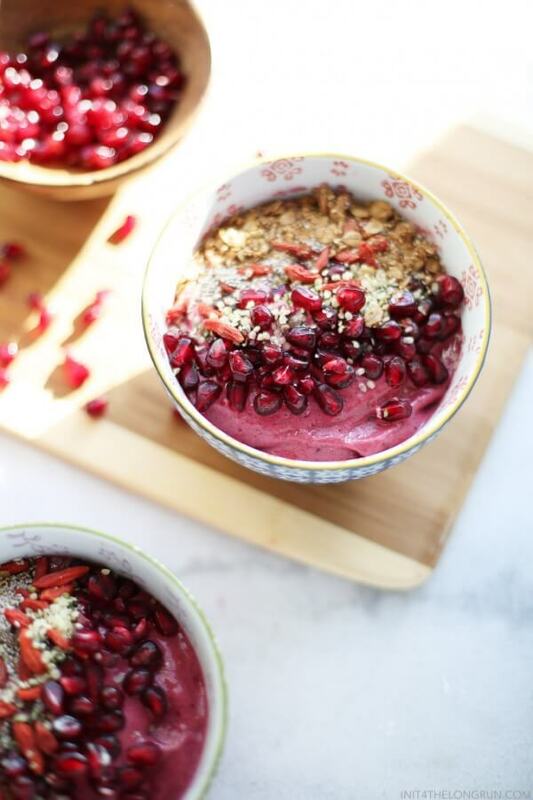 I said that there aren't many smoothie or smoothie bowl recipes that use pomegranate, but here is another one. This time, even the color of the smoothie really looks like pomegranate, but that's largely because of the other berries. In fact, this recipe uses pomegranate as a topping rather than an ingredient. Even so, it's an appealing recipe and one that looks great in the bowl. You can check it out at init4thelongrun.com. This particular smoothie recipe is hosted over at peanutbutterandpeppers.com (which really is an interesting choice for a site name). At face value the recipe looks simple, and it does only contain five ingredients. But, don't let that simplicity fool you because this smoothie contains some ingredients that aren't very common in breakfast smoothies. To find out what I mean, you'll need to check out the recipe for yourself. But, to me, the recipe feels like a combination of overnight oats and a smoothie bowl. That might be an unusual combination, but it is also a pretty appealing one. 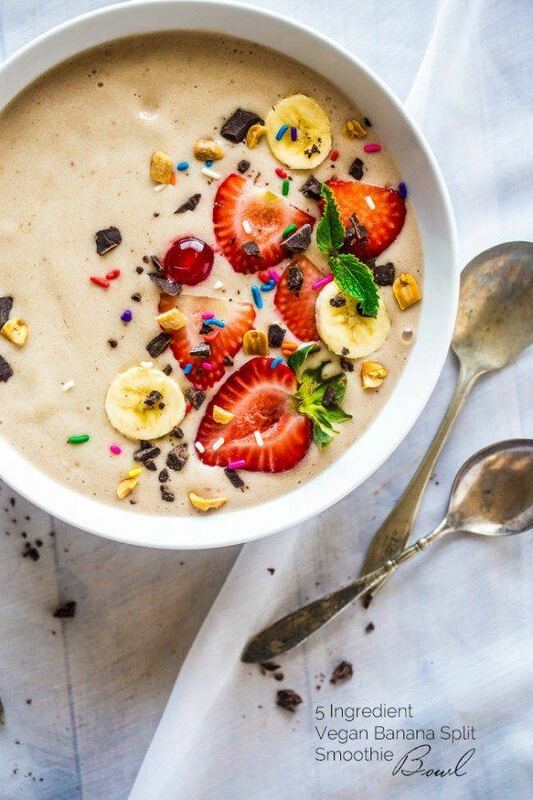 I found this smoothie bowl at louloubiscuit.com and it's another example of amazing photography. I particularly like the use of purple, even though this is a color that you rarely see in food. The recipe itself also sounds quite appealing. This recipe combines greens and chocolate, which means that you wouldn't really taste the greens. I love that approach because it's a great way of getting greens into your diet without having to taste them too much. 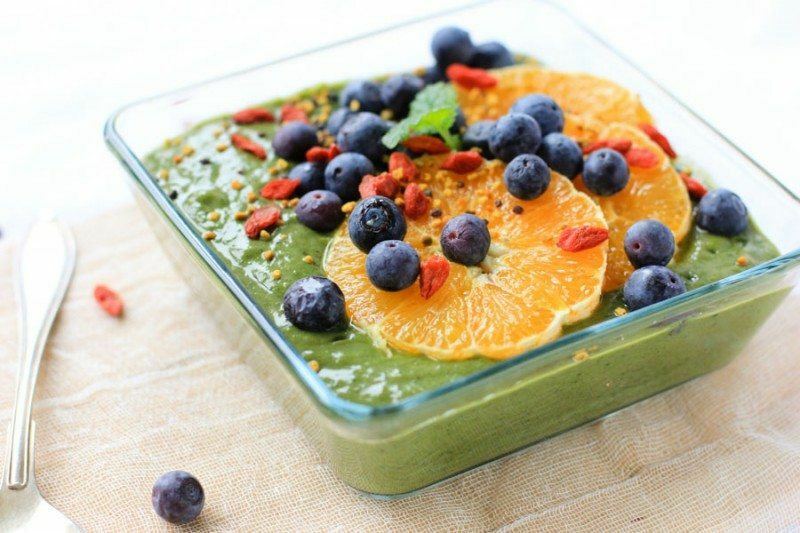 This recipe comes from thesimpleveganista.com and it's an example of a bright and colorful smoothie bowl. Once more, you can choose your own toppings, and you could also serve it in a smaller bowl if you felt like it. 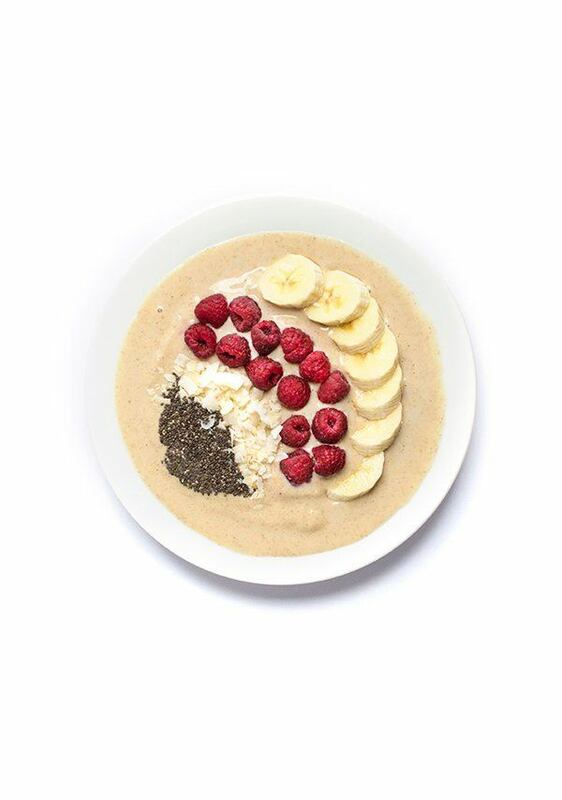 Whatever you choose, this is a healthy smoothie bowl and a great way to start off a morning. Mint chocolate chip is always a popular flavor, and it would be a perfect option for breakfast. This smoothie also contains greens (specifically spinach), even though it doesn't look like it visually. 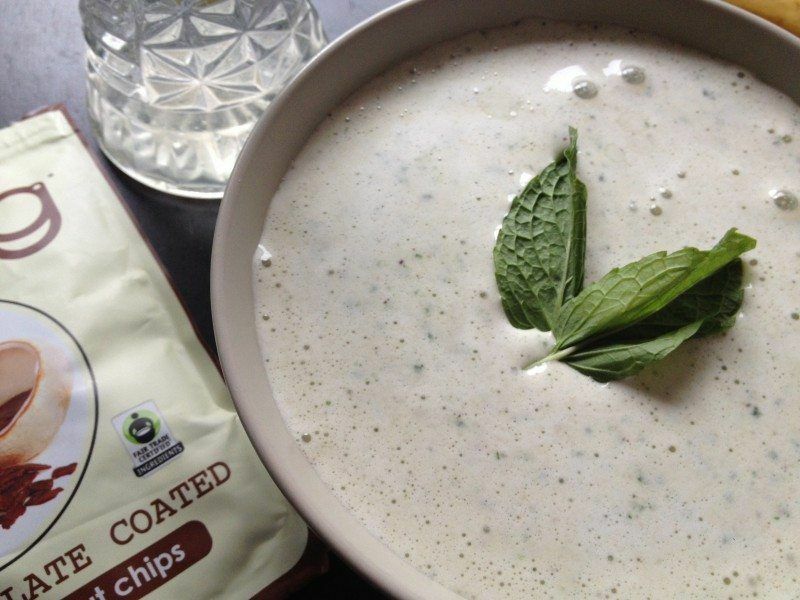 Of all the smoothie bowl recipes on this list, this would be one of my first picks simply because of the mint. You can find the recipe at honestlyfitness.com and the author also offers some substitutions you can use if you don't like the recipe as written. This smoothie bowl is a bit different than most other smoothies bowls, as it uses an unusual ingredient to help make it smooth and creamy. I'm not going to tell you what that ingredient is, but do go over to breakfastcriminals.com to have a look at it. I love the bowl that the smoothie is served in and there is a story behind that bowl, which is talked about on the website. 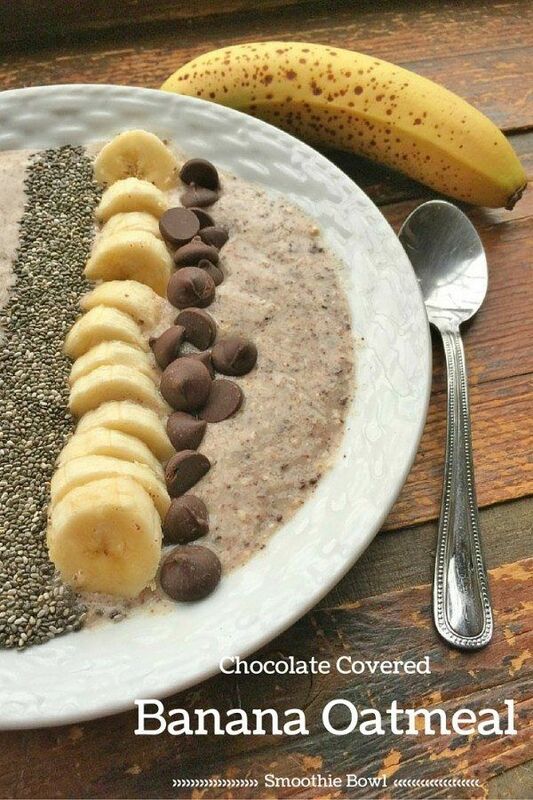 With this smoothie bowl, the main flavors are chocolate and banana, as you can probably figure out from the main image alone. That combination is very popular and it's easy to see why. Personally, I think this smoothie bowl looks very good, and I like the fact that it only has a few simple toppings. If you want to try this one for yourself, the recipe is from divasrunforbling.com. 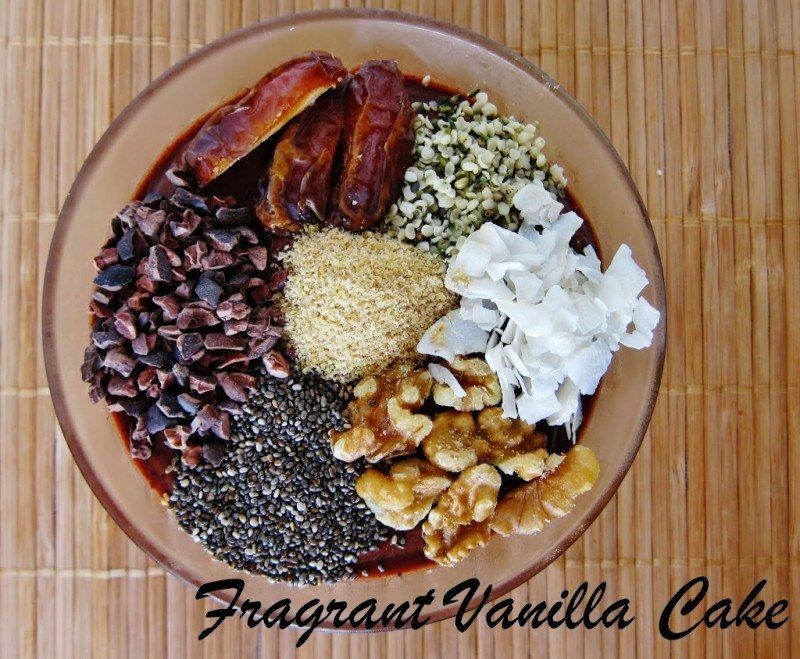 Here's an interesting flavor for a smoothie bowl. 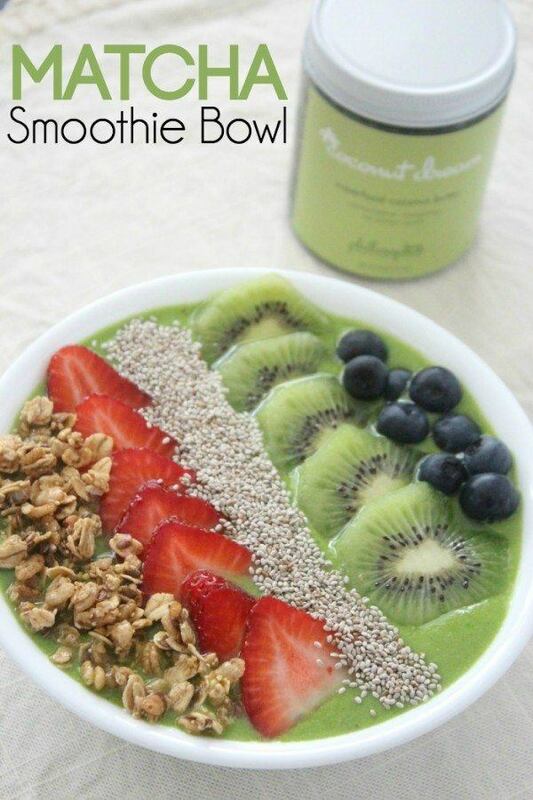 This one makes use of matcha green tea powder to give the smoothie bowl a green tea flavor. That would be great for any fans of green tea, and also makes the smoothie particularly healthy. 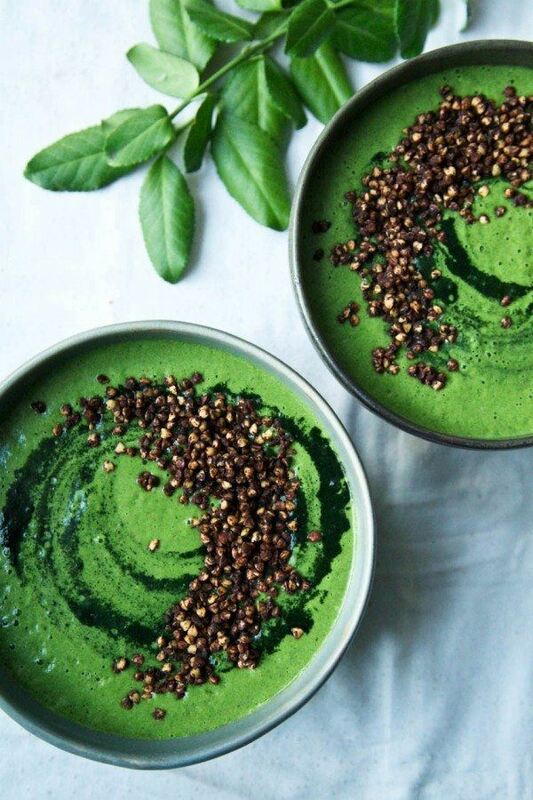 In this case, the most of the green color of the smoothie actually comes from that green tea powder, although the smoothie bowl does also contain spinach. If you want to give this one a go, you can find it over at framedfrosting.com. 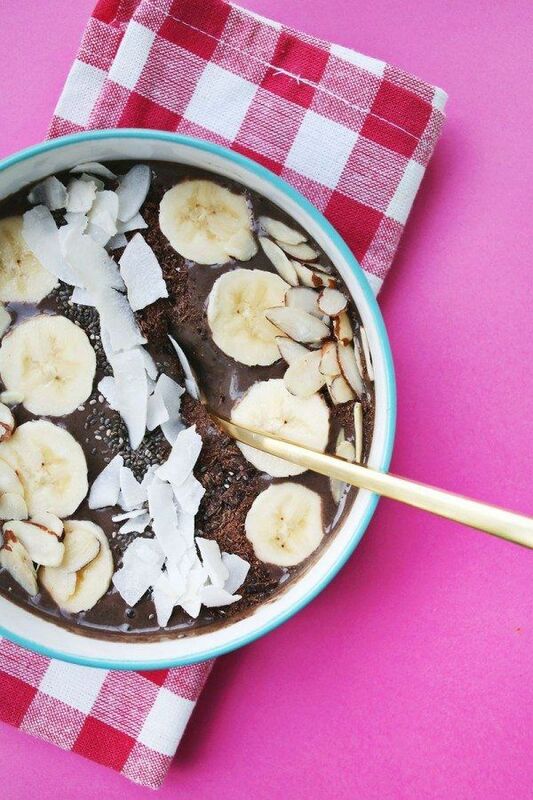 Chocolate is a good flavor for a smoothie bowl and this recipe offers a vegan version. The recipe itself only has four ingredients. 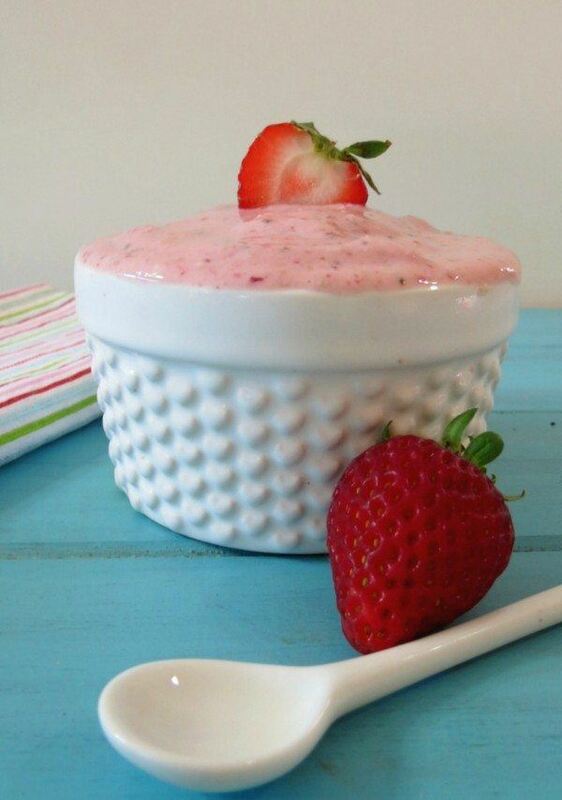 I always find recipes like that appealing and this one also looks really cool in the bowl. The recipe does have a few more steps that typically smoothie bowls, but it's still a simple recipe to make. If you want to have a go at it, you can find this recipe at 84thand3rd.com. This recipe is a good combination of flavors for this season. 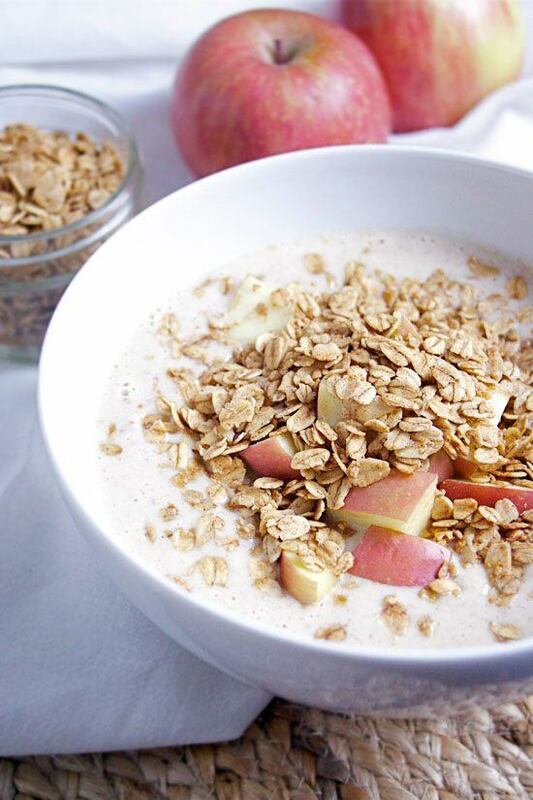 You commonly find apple and cinnamon used on oatmeal, but using it in a smoothie bowl is pretty cool. The recipe uses a few different spices to help create the spiced apple flavor. The recipe is hosted over at kitchenkonfidence.com. 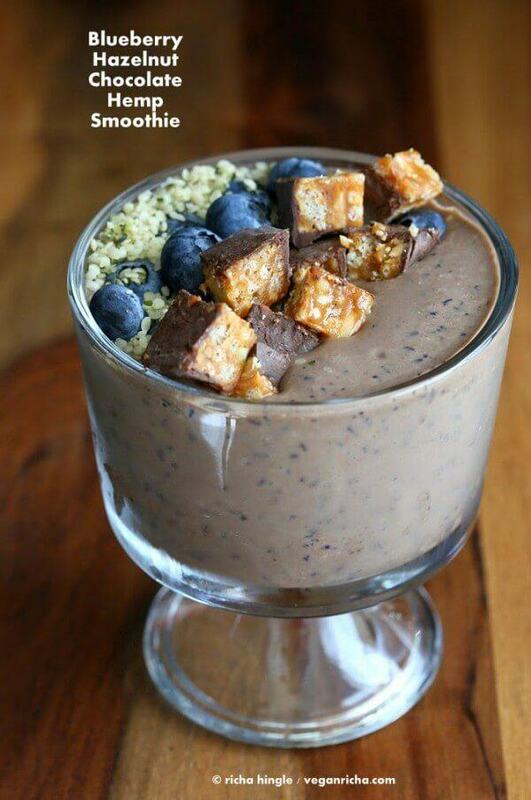 Here's a twist on the common chocolate smoothie bowl. In this case, the creator uses hemp seeds, which makes the recipe that much more interesting. The toppings are a bit unique too, which is another reason to check this recipe out at veganricha.com. 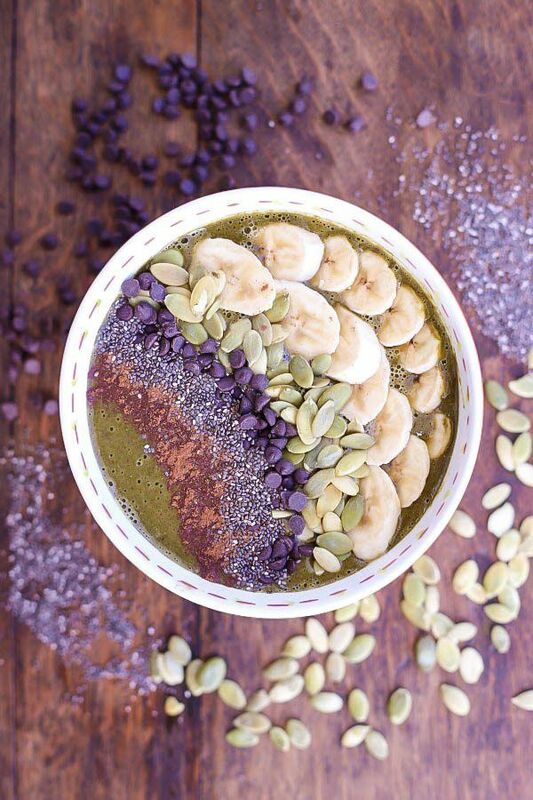 This is a detox smoothie bowl recipe and it contains a few interesting ingredients, including hemp protein powder. The combination of flavors seems to work well though and I do love the choice of toppings for the smoothie. The recipe itself comes from wolfgoesvegan.com and it is certainly worth checking out. This is the second recipe in this list that is a combination of overnight oats and a smoothie bowl. There aren't a lot of recipes that do this, but it does make sense. After all, oats are a traditional breakfast choice anyway, so combining them with a smoothie bowl makes a lot of sense. This recipe comes from ahealthylifeforme.com and it is a good one to check out. Carrots might not be a common addition to smoothies, but there isn't any reason why not. This is another smoothie that makes use of oats as well, although the oats are not soaked overnight. 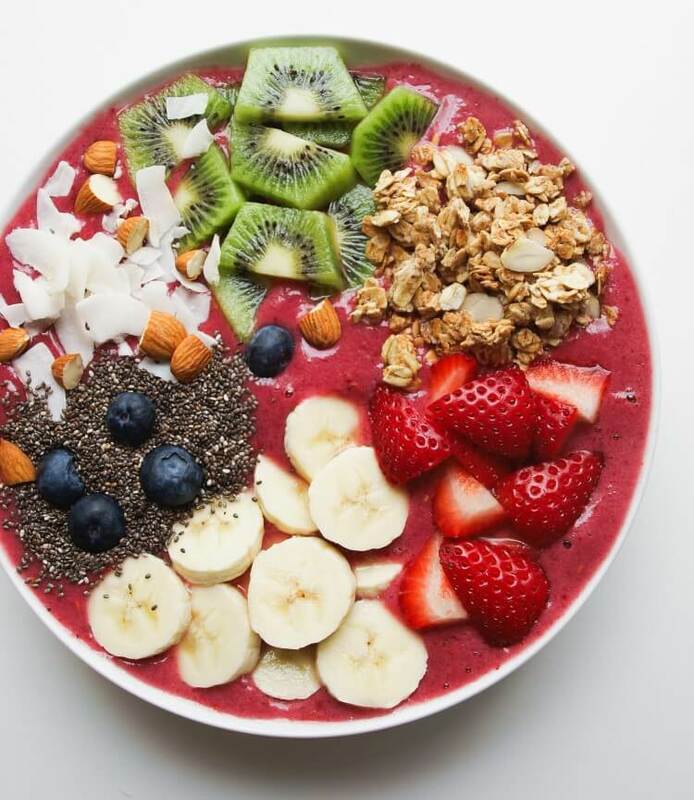 I think the smoothie would end up tasting pretty good, although it does not have the thick consistency that you find in most smoothie bowl recipes. The recipe comes from kiipfit.com and it is worth having a look at. 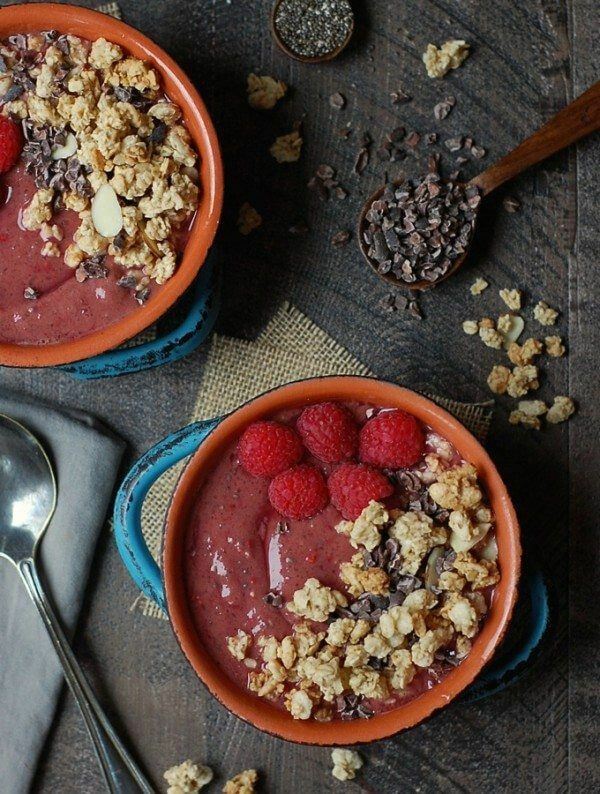 I have always loved the combination of raspberry and chocolate, and this smoothie bowl looks like it would be a great option for breakfast. The recipe comes from turniptheoven.com, so you can head over there to check it out. It is an appealing recipe and one that I want to try out myself. 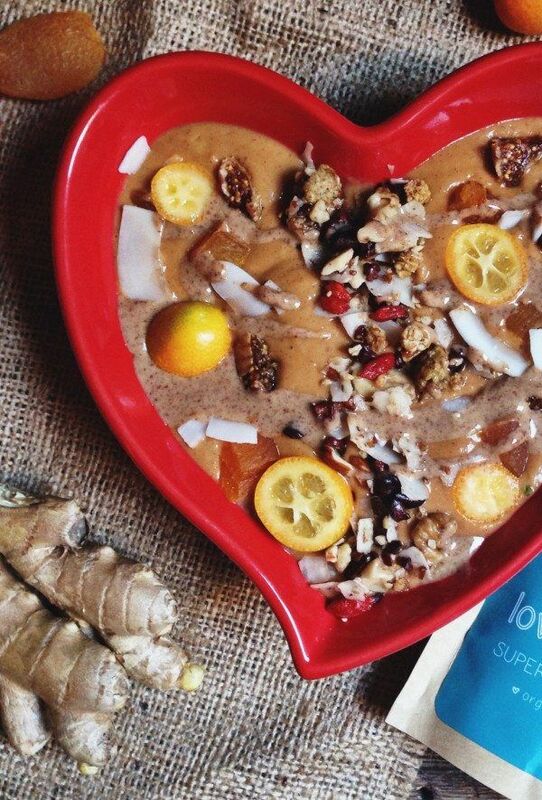 Here's another unusual smoothie bowl recipe. This time, it's a variation on apple crumble and it looks it would be a tasty example of a smoothie bowl. The oats and Greek yogurt in this recipe would also help to make it particularly filling, which is reason enough to give it ago. You can find the recipe at tryanythingonceculinary.com if you are interested in having a go at it. As the image shows, this recipe is a combination of chocolate and avocado, which is a set of flavors that works very well together. 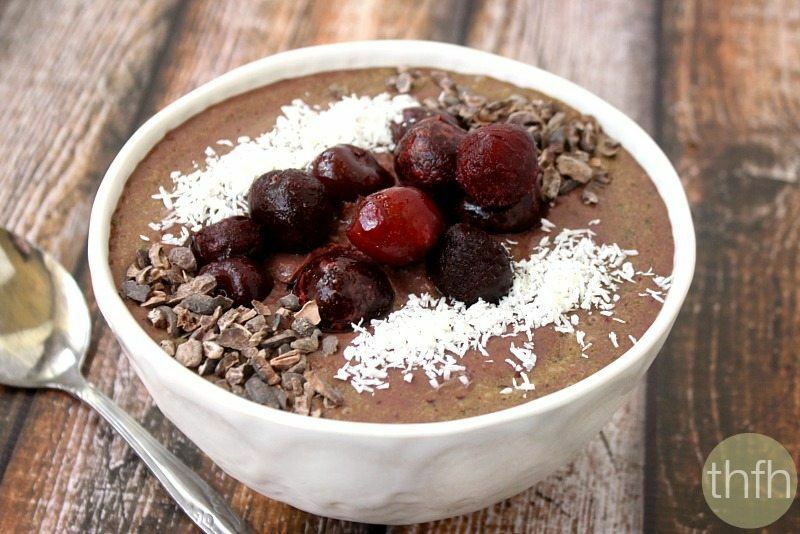 This might be a chocolate smoothie bowl, but it is still a healthy smoothie and has a number of healthy ingredients. If you want to have a go at it, you can find the recipe at theeasyhealthyway.com. I found this recipe over at simpleveganblog.com and it is a good example of a blueberry smoothie. The authors do use a few unexpected ingredients, which help to make the taste of the smoothie bowl a bit more interesting. The photography work is really amazing too, and I noticed a lot of fantastic food photography on the site. 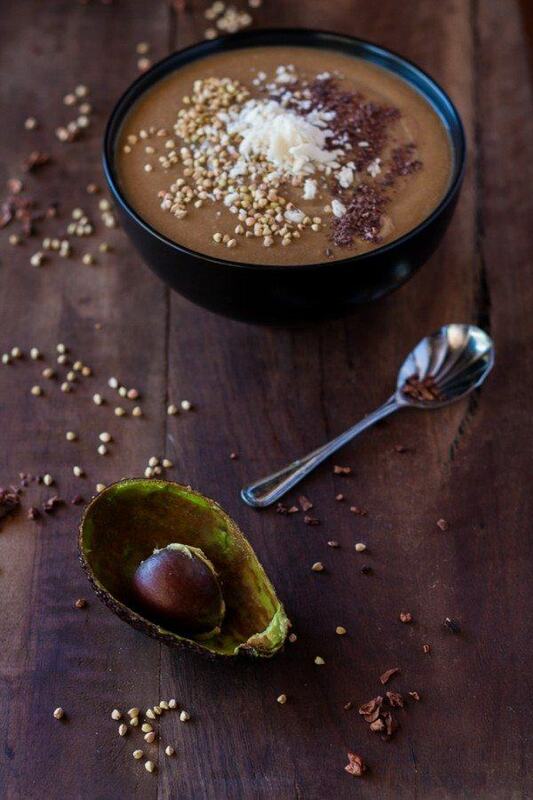 Superfoods and chocolate in the same breakfast, who can do better than that? This recipe is a great way to combine a healthy breakfast with something that tastes and feels like you are eating dessert. The flavors sound like they would work really well together too, which just serves to make this smoothie bowl recipe more appealing. You can find the full recipe for it over at bromabakery.com if you're interested in having a go at it. 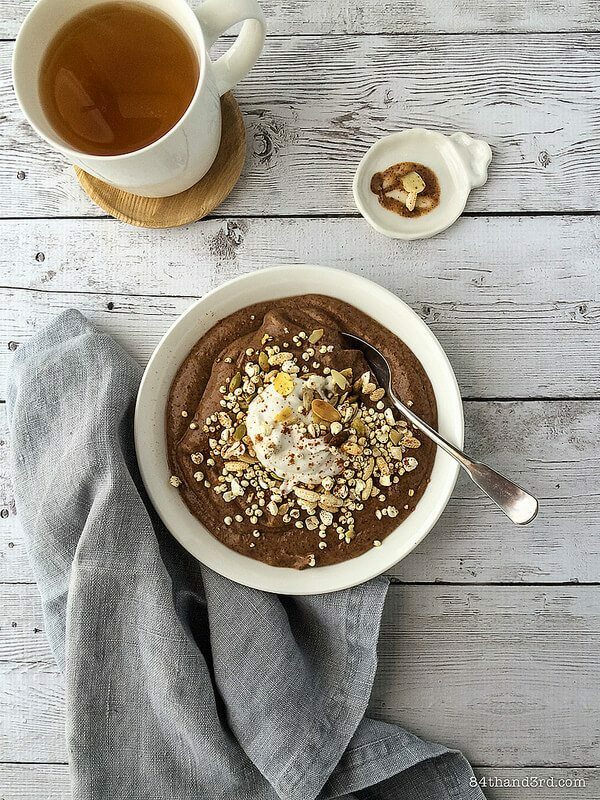 This recipe, from abeautifulmess.com is also for a chocolate smoothie bowl, but in this case the recipe focuses on dark chocolate. I've always been a fan of dark chocolate and it can often be nicer than milk chocolate, particularly in cooking. 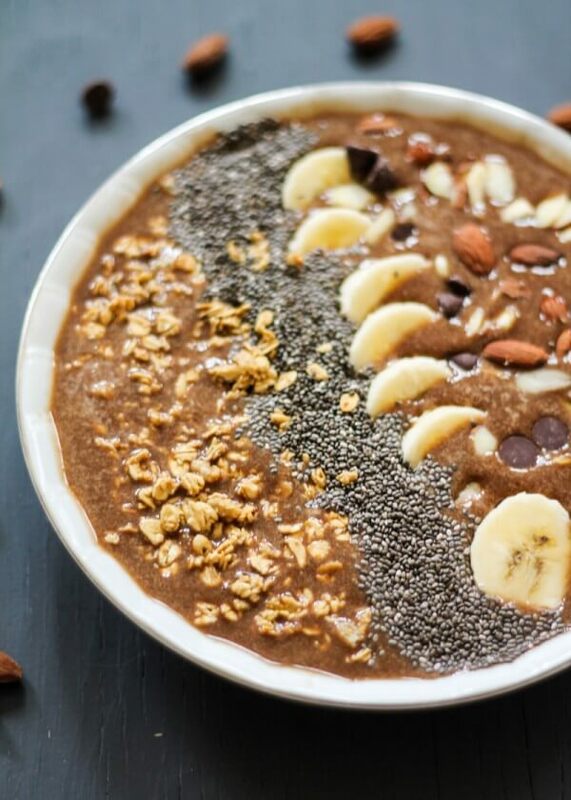 Using dark chocolate in a smoothie bowl would result in a little less sweetness, which might be appealing overall. Plus, the dark color of the smoothie looks great in a light colored bowl. This final smoothie bowl comes from hotforfoodblog.com and it is actually a vegan smoothie bowl recipe. With this smoothie bowl, the key ingredient is frozen blueberries, which gives it the bright color. The author also uses orange juice in the recipe. That approach would work well and the flavor from the juice would complement the blueberries and the other ingredients. 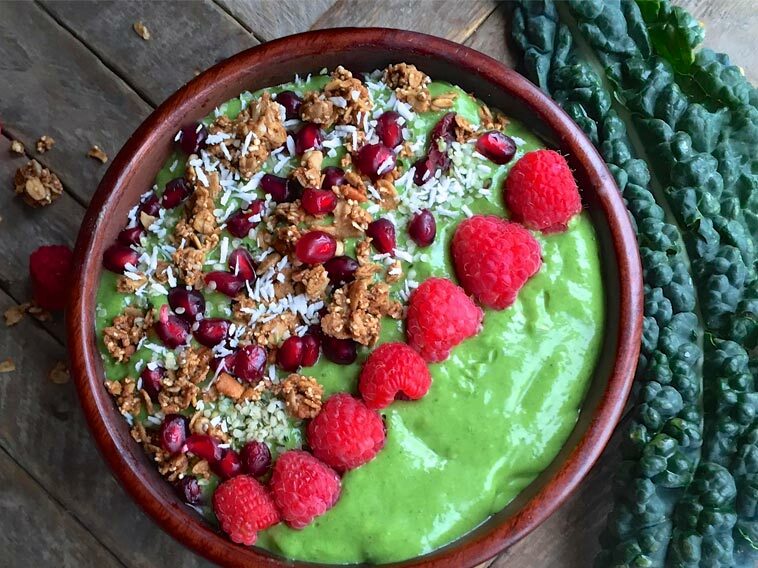 Thank you so much for featuring my Matcha Green Tea Smoothie Bowl! It’s one of my favorite ways to eat greens and matcha tea has tremendous health benefits.